Todd McFarlane only drew a paltry "7" published Incredible Hulk covers in his entire Marvel career! This "INCREDIBLE" Hulk cover right here is the 8th! This cover was penciled by the great Todd McFarlane, and inked by Al Gordon, and was supposed to be published for Todd's very last Hulk cover for the August 1988 and #346 issue. 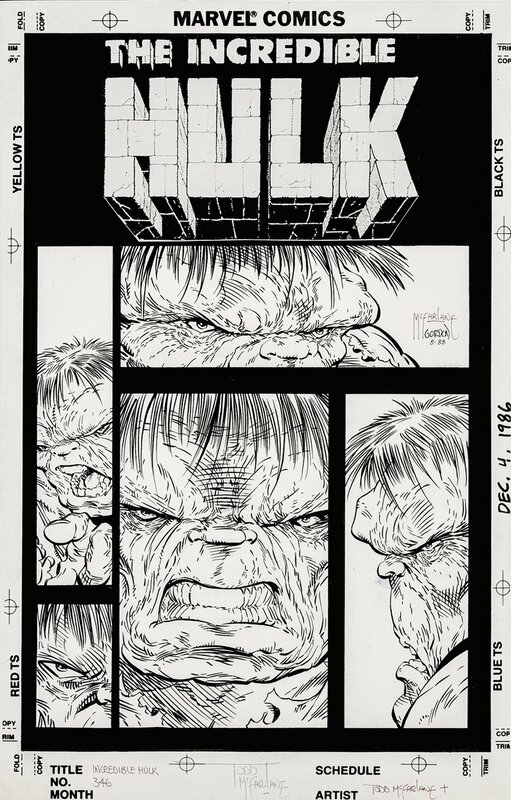 For whatever reason, in the editor's Dept most likely, This beautiful cover was not used and another cover penciled by Eric Larsen and inked by Todd was used instead, making the Incredible Hulk #345 cover as the last PUBLISHED Todd McFarlane Hulk cover, and this great cover became unpublished. It is a shame, as the apparent theme of this cover was "The many moods of the Hulk" which comes through quite well with the 5 really cool head shots of the GRAY GOLIATH all around this intricate cover! This cover was signed by Todd McFarlane not once.... not twice... but "3" TIMES! Just a great cover which will cost you a "FRACTION" of what a published Todd McFarlane cover would cost if it ever... ever.... EVER came up for sale! The logo is a replacement and this art was drawn on 1988 Marvel cover stock! ALL art on our website (including this one) are able to be purchased with VERY fair time payments, and trades are always considered towards "ANY" art on our website! Just send us an email to mikeburkey@aol.com and we can try to work something out. Page: 3 (1988) SOLD SOLD SOLD! Page: 24 SPLASH (1988) SOLD SOLD SOLD! Page: 2 (1989) SOLD SOLD SOLD! Page: 17 (1989) SOLD SOLD SOLD! Spider-Man #3 Cover (1990) SOLD SOLD SOLD! Spider-Man #4 Cover (1990) SOLD SOLD SOLD! Spider-Man #6 p 2-3 Double Spread Splash (Very Large) SOLD SOLD SOLD! Spider-Man #9 Cover (1990) SOLD SOLD SOLD!